We set up the farm shop enterprise in the 1990's selling potatoes from a local lay-by. 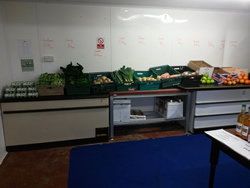 This has evolved into selling seasonal fruit and vegetables, locally sourced where available, along with local apple juice, honey and free range eggs. 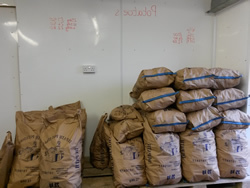 We open every Saturday from 9.30am to 3.30pm, from the last Saturday in September through to the last Saturday in April - when our potatoes are in season! Free range eggs from Davey's cracking good eggs, honey and apple juice from Kings Orchard (www.Kingsorchardproduce.co.uk) are available all year round. At Christmas we offer an ordering service for turkey and vegetables for your Christmas Dinner. The Turkeys are produced by Frenchbeer Farm based near Chagford in the Dartmoor National Park.